Can we slow down myopia? Why see the myopic blur? Astigmatism and graph "double plot." Nommograme of Gatinel for the correction of presbyopia at the farsighted. Eye rubbing: the root cause of Keratoconus? Crosslinking: pure wound healing effect? Influence of the actual position of the implant on the refraction: concrete example. During the cataract surgery, remove the lens that is clouded and causes Visual discomfort. Monofocal implant (monofocal implant) are intended to compensate for the strong farsightedness which would be induced if you did not compensate the reduction of optical power ' vergence) related to the removal of the lens. The monofocal implant is comparable to a biconvex converging lens with a single optical power. This is expressed in diopters, and is calculated through biometric examination (biometrics). For each model of implant, the surgeon has a wide range of powers (from-10 to + 30 diopters diopters by 0.50 no D for the more extensive ranges). More the dioptre power is high, more implant focus almost the light; as a result, eyes operated initially farsighted (short) generally receive implants of Dioptric power higher than the nearsighted eyes (long eyes). A monofocal implant artificial lens is always made optical part, and some haptic (intended for position and stabilize the implant in the eye). The diameter of the optic is close to 6 mm. Implants can be made up of 3 parts like this (a lens and two haptic), or "single-piece": haptic and optical are "print" or carved into a block, and so made up of the same material. The lens is a natural lens that has (at rest, without accommodation) optical power close to 20 to 22 D in the eye: this power is used to supplement that of the cornea for converging the incident light on the retina. However, this power can vary slightly from one patient to the next, and tends to increase in case of cataract. The cataract surgery to remove the lens, the power of the eye is "weakened" if one does not replace the implant by an artificial (implant) of appropriate power. An operated eye cataracts without implant placement is an eye said "aphake" (aphakia). The optical power of the cornea is not enough to make converge the incident light rays on the retina: measured in terms of the glasses (1.2 cm in front of the eye), this farsightedness is averaging close to 12 diopters. The optical power of the monofocal implant is chosen according to the results of the biometric calculation (biometrics). Biometrics is based on measurement of the length of the eye (axial length), and the measurement of the optical power of the cornea (keratometry). Broadly speaking, when we know the length of the eye and the keratometry, we can predict the means of formulas (ex: formula SRK - T, Haigis formula, etc.) the power of the implant that will allow the 'Emmetropic' eye (naturally corrected for distance vision), if the patient wishes to see from a distance without glasses (emmetropisation). In this case, the power is calculated so that once the implant is placed in the eye, the light rays emitted by a distant source are focused on the retina. For patients who wish to read without glasses, one computes the power of the implant in order to this that once inserted into the eye, it misleads a slight myopisation, allowing the rays from a close source (ex: book) focus on the retina. Optimize the optical quality of the operated eye is logical when it comes to patient independent optical correction by glasses for distance vision, thus monofocal implants are today aspherical and generate negative spherical aberration to compensate for all or part of the corneal positive spherical aberration. 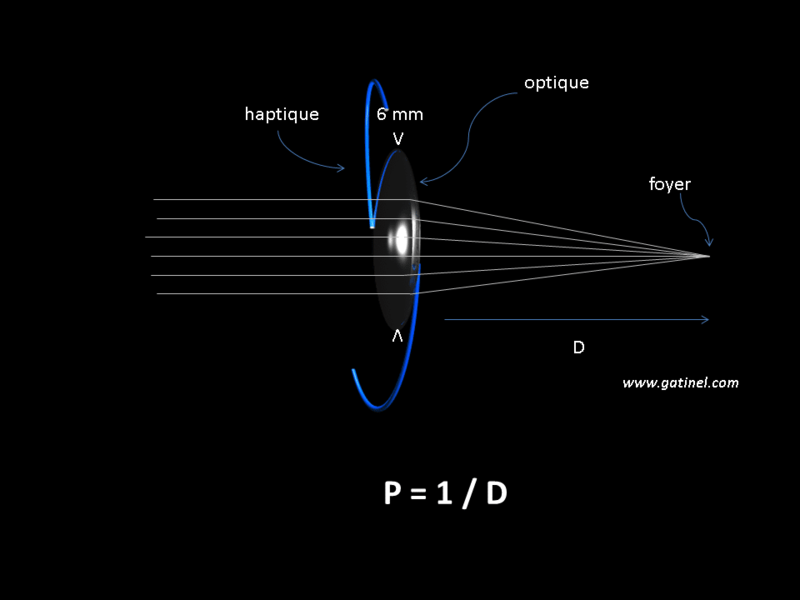 The optical part of the first implants (artificial Crystal) pseudophakes was classically a little biconvex lens (near 6 mm diameter) to spherical surfaces, including the curvature (and refractive index) determines the optical power. This spherical geometry was dictated by industrial constraints but induced no profit in functional terms. Ideally, the artificial lens implant should return to the patient operated a visual quality equivalent to that of the young subjects, many studies have highlighted a reduction in the optical quality of the eyes pseudophakes with respect to the phakes and healthy eyes. The optical quality of the result depends on obtaining a superior visual acuity or equal to 10/10 without correction from a distance, but to maintain it for the weakly contrasting and/or night vision objects. In the case of an emmetropisation in both eyes, the port of a correction still required to close fine vision (reading). Some (initially myopic) patients wish to retain a slight myopia in order to be able to read without glasses; they will then wear a correction in glasses glasses to see far away. THEastigmatism eyepiece is mostly original corneal and its correction may be considered during the cataract operation by conducting additional corneal incisions, or the insertion of an implant of toric artificial lens. A toric implant has a generating of astigmatism: when positioning the implant to ensure astigmatism that it induces is oriented at 90 ° with respect to that of the cornea. The biometric calculation of toric implant requires to take into account the corneal astigmatism. The placement of the o-ring implant requires special care during surgery (positioning and orientation of the implant). 28 responses to "monofocal implant"
I am 54 years old and I was operated cataract 24 days ago (myopia - 11). My night vision is catastrophic and I could not drive at night if I didn't have an eye with a lens and still very few achieved by cataracts. I will be very disappointed by the result in night vision. Can it get better as my surgeon told me that he did not know. It is difficult to answer your question without more detailed examination, and especially the refractive status of your operated eye. It is generally recommended to leave an eye initially very nearsighted (11 d) slightly nearsighted (ex:-2D). Nearsightedness, even slight, particularly penalizes vision in low light, so the night. Moreover, the condition of your retina is to check, in order to eliminate potential complications associated with high myopia. I was operated on for a cataract in the eye straight two days ago. I had previously consulted two ophthalmologist: one proposed a 17D implant, the other (the one I retained) put me a 18D implant. Is there a big difference between these two proposals? Or did the two specialists come to the same conclusion knowing that I want to see closely and by far. On the other hand, the operated eye sees well closely and with intermediate vision. On the other hand, the vision from afar (if slightly improved) remains blurred anyway. Is that normal? Will the second eye operation next week optimize vision from afar? Thanking you for your answers. 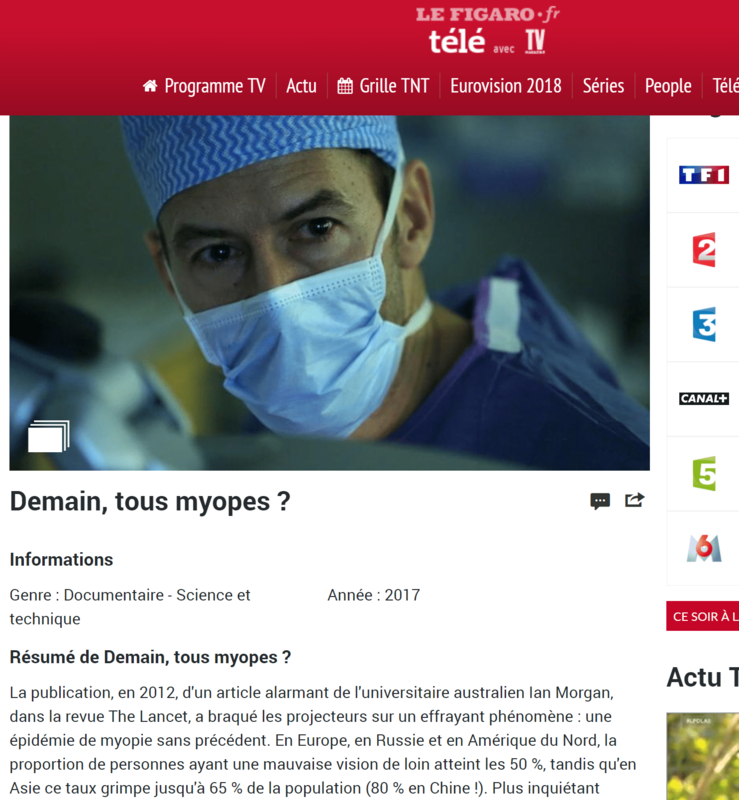 Your surgeon has actually opted for a solution of "monovision": the operated eye first has been 'myopisé', he sees net close without glasses, but by far the vision is blurred. The other eye will probably be a clear vision from afar, but fuzzy close. The choice between 17 d and 18 d represents a small difference in practice, and it is can be linked to a different implant choice (kind of like for the sizes of shoes, which vary from one brand to another). It is commonness of implant of artificial lens in the context of the clear lens surgery (which is in any point technically similar to a cataract surgery: removal of the lens and replacement with an implant whose power is adapted to correct hyperopia). In some case it is also possible to propose multifocal implants (to see far, intermediate and closely: trifocal implant). If your farsightedness is low or medium, a LASIK surgery could also be considered (less than 4 D hyperopia). Thank you for these explanations. I'll have a few questions. 56 years, "cataract of the Myopic fort", recently operated (right eye 2 weeks ago with monofocal Implant 10, 5d, left eye two days ago, with implant 9.00 – "Myopia" predicted-3), I see rather net by far as ± 60 cm. – My professional activity consists almost exclusively of alternating paper reading and screen reading, about 7 hours a day. What is the recommended time before resuming it? – several days after the operation of the right eye, the middle vision and by far has become more blurred, and sometimes I observe a clear duplication of the image: What is this due? Can it be remedied? – How many weeks after the second operation do I have to make an appointment with the ophthalmologist to see if I need glasses for vision from near or far? Thank you so much for your attention. The surgeon who operated on me does not seem to care about my professional activity, and is evasive of my questions. It is difficult to specifically answer your questions without knowing the refraction of the eye after surgery (degree of residual myopia actually got). Can't predict this degree from the optical power of the monofocal implant alone. If your distance vision and intermediary (60cm) seems correct, we can deduce that at least over one eye, there is a close myopia of-1.50 D, which, for a former myopic strong enough to induce the impression of a 'good' distance vision. The work may be resumed a few days after the intervention; The vision of documents or screen does not "fatigue" the eye operated. A doubling of the image (Monocular diplop) can be induced by a more or less regular corneal astigmatism, which can evolve according to the scarring, and be partially compensated by a correction in glasses. A consultation appointment to check this correction can be done 3 weeks after the procedure. Actually, a few days after the second eye operation my "residual" myopia was evaluated at-2. On the fatigue side, some lights cause me to vibrate inside the eye (apparently pupil), with very annoying light sensations, and I am relieved that my work stoppage has been extended to 12 days. I have to have an operation next Monday the 22 for the left eye, will follow the other eye, I would like a lens * bifocal * I do not know if c good term, but is to advise for me no longer wear glasses after cataract operation, I would like to. Bifocal or trifocals implants (so-called multifocal implants) allow to correct vision for not having to wear glasses for distance and near (reading, computer, etc.). All patients are not eligible for a multifocal implant placement and it is necessary to perform a detailed ophthalmological balance to check. Ask your surgeon about this point and make him part of your wish. Implants. I talked to my optician, he tells me that the laying of implants is risky and that above all I will take away a Crystalline lens that is not reached by cataract..... So I'm a little panicked.... can you advise me. In advance thank you. The clear lens surgery resembles in every way cataract technically. Finevision Toric implants are trifocals implants that correct astigmatism. In principle, they can correct all of your optical problems. The clear lens surgery exposes indeed to some complications, which is low, but which must weigh in the decision procedure. In patients who have no other worries that the correction (not cataracts, so no veil, pre-existing disorder), seem to be more pronounced adverse visual effects of multifocal implants (nocturnal halos) (it is a subjective phenomenon understandable; cataract occaseionne usually halos and a Visual gene significantly higher than those that provide multifocal implants last generation). Thanks for your explanatory, remarkably detailed and precise records! I see passing some floating bodies now, sometimes it just focuses right in front of the eye when I look closely, but it's temporary.. Is this the fact that I had not noticed them before the operation (Cataract was advanced) or it is part of the small problems to be welcomed quietly, (the eye was very myopic, I am 60 years old), and is it true that they can "decant" down the Glazed body, even disappear after a few months? The perception of floaters after cataract surgery is a common side effect. In some patients, this pre feeling existed at surgery but was well noted due to low vision related to cataract. In some case it seems that surgery can accelerate the evolution of posterior vitreous detachment, which can also promote the appearance of floaters. In some case, these can fade, but certainly not disappear completely. It will just move a little in your Visual field and you will get used. Hello I was operated for cataract with a monofocal implant that corrects my myopia of 6.5 but since my operation I have big halo and an eblouissment side on artificial lights in brightness reduced... c is a real ordeal because I'm very dazzled. l eye doctor tells me that the implant is well positioned and there is no problem, but I have big genes night... is this going to s mitigate with time... He me di that the implant will be fibroser. It is likely that you have some dysphotopsieswhich are often transients when the surgery went well. Be sure to check the page in lin for more details. Your symptoms are similar indeed in what we call a dysphotopsies. One page is dedicated to these symptoms relatively common after cataract but who most often fade gradually and completely. Halos you present are certainly called for dysphotopsies, consequence of "edge effects" of the implant under certain circumstances. These halos are located on the periphery of the Visual field, and appear especially when a bright light is located on the external side of the eye. In general, these phenomena disappear gradually over time. Hello Dr, I'm an internal ophthalmology freshly landed, and this morning I had to correct a patient for her vision of meadows on pseudophaques eyes with monofocal lens from afar for each eye, the visual acuity from afar is 1 for each eye without Correction, I just applied the setpoint to put + 2.5 for each eye in order to correct this patient in vision of meadows and this without being explained to me really why. I know that the eye loses its power of accommodation after cataract surgery and that often the patient needs a correction of meadows in case of monofocal lens. I would like to know if this correction of meadow (+ 2.5) diopter applies to any eye pseudophaque with monofocal implant and visual acuity from afar to 1 or not?? In this case on what basis should I rely. Thank you in advance for your availability and possible explanations. The prescription of a "standard" correction of + 2.50 D to correct the vision of almost an eye deprived of any accommodation but emmetropic in vision from afar rests on the relationship between vergence and distance of sharpness. With + 2.50 D (which thus creates a myopia of-2.50 D when wearing this correction for an eye initially emmetropic), we obtain a distance of sharpness for the punctum remotum equal to about 1/2.50 = 0.4 m – or 40 cm = "classical" reading distance. However, some patients may need a lower correction (eg: 2.00 d), and it is always best to do a test by priviélgiant a mount correction to what the eye of a given patient requires effective for close vision. I operated the left eye of the cataract because of a high myopia. After laying a lens, I still have-4.5 diopter myopia. I'm disappointed. I have not yet operated the right eye. How much to aim for the right eye? Can one after cataract make a PRK laser? Mr. Doctor Ganeshan, I 85ans following a cataract operation that caused the destruction of the capsule "sac of Crystalline lens" The surgeon offers me a secondary implant fixed on the iris, this implies complications, I Understand that there are different types of implants, currently my eye is not focusing on the retine. There is also a possibility of wearing lenses if they are tolerées, can you tell me what can I do. In case capsular rupture with impossibility of implantation in the cristallinien sac, it is possible to envisage the installation of an implant attached to the iris (Artisan), or the suturing of an implant to the sclera (wall) of the eye. Finally, the port of a Contact lens is also possible. This is to compensate for the hyperopia induced by the absence of Crystalline lens and its replacement by an artificial Crystalline lens implant (state of Aphakia). A PKR (or LASIK) is actually conceivable to reduce your residual myopia on the left side (eg: let-2.50 D, ie correct 2d). To the right, it is best to leave a myopia between-1.50 D and-2.50 D according to your visual aspirations and needs. In case of initial strong myopia, we usually prefer to leave a little myopia to allow the myopic to continue reading from afar without glasses. The vision of far fine (driving, TV, shows) can be corrected glasses, but for other activities of daily life (domestic and Office), it may be possible to live without glasses. You can ask questions or comment on this content: for this, use the "comments" form located below. The questions and comments of a general interest will be processed and published, and the information provided on the relevant pages should be clarified or supplemented. This site respects the principles of the HONcode Charter.